When reports of a widespread, deadly 'outbreak' begin to surface, these ordinary people face extraordinary circumstances and suddenly their fates are intertwined. Recognizing they can’t outrun the danger, Scarlet, Nathan, and Miranda desperately seek shelter at the same secluded ranch, Red Hill. Emotions run high while old and new relationships are tested in the face of a terrifying enemy, an enemy who no longer remembers what it’s like to be human. It begin with a news report, a virus had been spreading throughout Europe and verged on epidemic proportions, but working as a technician at the hospital, viruses and illness are but a mere everyday occurrence. Looking back, the world was a relatively safe place... And Scarlet is about see what very may be the death of mankind. They walk with limps, dragging themselves awkwardly through the streets looking for their next meal. Victims are savagely attacked and eaten by reanimated corpses with milky white eyes. The scene is horrific. Former husband Andrew has shared custody of Scarlet's children and while the virus starts to cross borders and oceans, Andrew will be collecting Jenna and Hallie from school while Scarlet is coming into contact with what could be the first local patient to become infected. Within the hour, the hospital is overrun with hostile patients, and as Scarlet is ending her shift, she needs to intercept her daughters. The streets are chaotic, those who are healthy are being hunted and run down by those infected. To survive, Scarlet knows she will need to leave the city. The safest place to wait the apocalypse out is at Red Hill, a secluded ranch owned by a work colleague who's daughters were expected to visit this weekend. But first she must stop by her hometown of Anderson, where Andrew still lives and is hopefully keeping her girls safe. The hordes of reanimated citizens are surrounding the local church, towns are closed off with the armed forces shooting to kill on site, but nothing will keep Scarlet from her children. Nathan has been unhappily married for some time, little did he know that the day the world crumbled, his wife had walked out on he and daughter Zoe, leaving only an apology and a note. Running from the school with Zoe, gunfire rings out through the streets. Nathan's first instinct is to flee to his brother in laws house in the tiny country town. But Skeeter and Jill's small house in the town of Fairview isn't the safe haven Nathan expected, with the infected breaking through windows. Their only option is to make their way to the local church, where the town is boarded up. But before the group reaches safety, one is bitten by the infected. Miranda and sister Ashley, along with boyfriends Cooper and Bryce are on their way to their father's ranch at Red Hill when the city is overrun. Driving the group of teens in her new convertible, Miranda is relieved in the knowledge that her father was prepared for disaster. A stocked pantry, weapons and their own water supply. But first they needed to make it to Red Hill alive. Three different paths will all lead to the same road... If they can each navigate the new apocalyptic world, and chances are, not everyone will make it there unharmed. 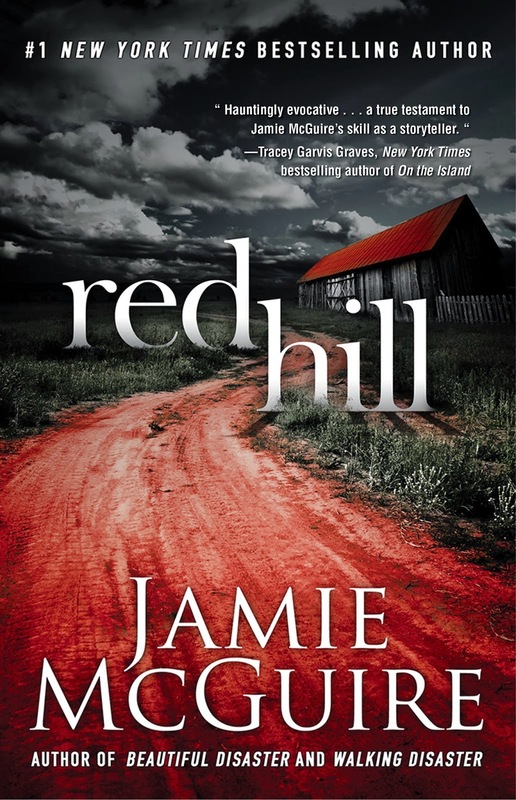 The premise of Red Hill sounded incredible, a survival zombie apocalypse romance. I was curious to see what Jamie McGuire was able to create, I quickly realised that it wasn't a whole lot. Told from three points of view, Scarlet the single mother who is trying to find her children, Nathan who is a newly single parent escaping with daughter Zoe and Miranda the college student. All three are trying to flee the city and headed towards neighboring country towns, inevitably all finding themselves at Red Hill. Scarlet had always admired her work colleagues home on the hill, as being one place that would remain untouched if the world ended. Nathan is heading to a neighboring town and Miranda's destination is Red Hill. Mix in the walking dead, or those infected and you would have thought that it would make for an interesting read. It did... For those who like their apocalyptic horror movies without the horror and gore. I assumed being new adult that perhaps there would have been far more horror, but the opposite seemed to be the case. Apart from chasing the uninfected down and feeding, it was almost zombies, brought to you by Nickelodeon. The only character who's storyline had any direction, was Scarlet searching for her children. No one seemed to have any direction besides making it to the isolated farm. 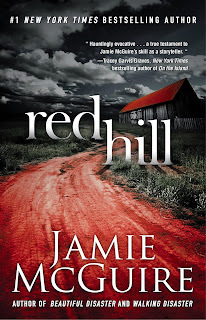 There was nothing particularly wrong with Red Hill, other than being boring. The storyline was slow and built to what seemed to be nothing in particular. I needed more, I wanted more... Sadly I just didn't get it. That's so weird why isn't there gore in this? I was under the impression there was because of the zombies. Weird...I'll have to try it out and see what I think of it. Hey Jeann. I'm assuming she didn't include too much, as to not spoil the romance of the survival aspect. Apocalyptic zombies, I just expected horror. I think for the new adult age group that it's targeted at, she could have blown us away.